A Culinary Delight of Latin American Food for the Family! EXPERIENCE A JOURNEY OF FLAVORS, ZEST AND CULINARY DELIGHT!... ABSOLUTELY FREE!! Yes, I Want My Copy of Not Just Tacos! 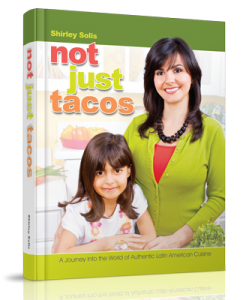 *Not Just Tacos Ebook retails for $9.99 on Amazon, but you get it FREE today only! You will have the choice to download the Kindle or iPad/Nook version. Raving Fans LOVE Not Just Tacos! Our family absolutely loves this book! We keep looking through it again and again, looking for our next delicious Latin American meal! I love the little tidbits of culture from each of the countries presented with the recipes. Tasting the variety in cultural food fascinated us. Each country's section contains beautiful photographs and facts about the country, which we read before we eat. Trying new ingredients held no challenges as the herbs/spices flavored everything deliciously. We have yet to find a recipe we dislike. Also impressive is the fact that as a vegetarian I easily adapted the meat recipes. Excited to start cooking! "What a fantastic idea...traveling around Latin America in my kitchen! My kids loved reading about each country and now we're each picking out the recipes we want to try first. Thank you for this wonderful home education tool!"